The Thalias is a women's club in the little town 20 miles East -- on the prairie of Missouri rather than the prairie of Kansas. A long standing Spring tradition of the Thalias is their Tasting Tour, held in even years. 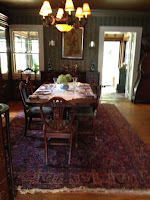 It is always a delightful Sunday afternoon as tour goers get to visit three homes and sample food at each. There is always an overall theme and this year's was Spring Fling and then each home has their own theme as well. Not only do you get to taste the food but you get to go home with the recipes as well. Many of Linderhof''s favorite and long standing recipes have come from this tour. The sideboard set up as for an Easter breakfast. Each dish is labeled with a cutout Easter egg attached to an egg cup with a real egg. 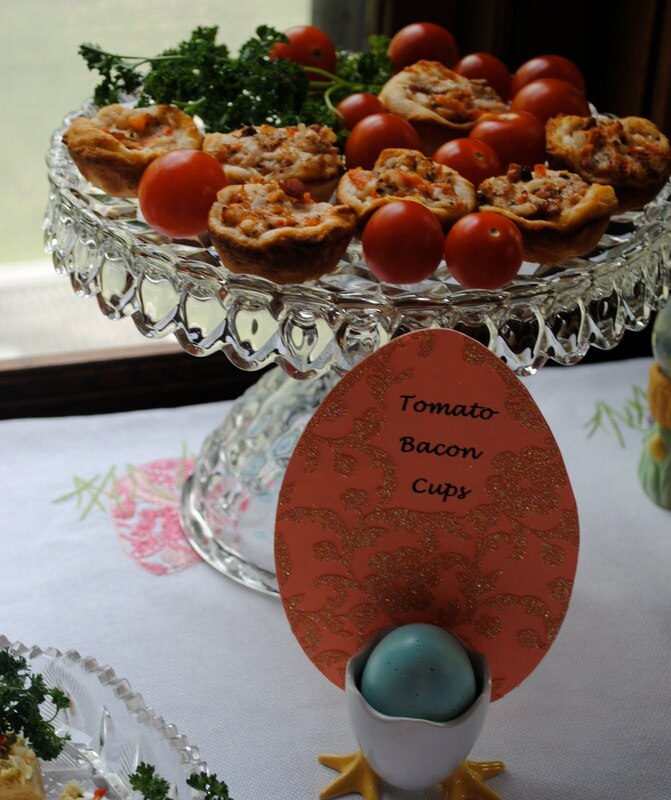 My favorite -- the Tomato Bacon Cups!!! In a small bowl, combine the tomato, mayonnaise, bacon, cheese, onion and basil. Set aside. Split each biscuit into three layers; press each layer into an ungreased miniature mufin cup. Spoon tomato mixture into cups. Bake at 450 for 8 to 10 minutes or until golden brown. Serve warm. At the second house, it was a Spring Fling! The dining room table with mock champagne and plenty of "bling"! Bling even on the placecards!!!! And my favorite -- the pina colada cheesecakes! Stir together crust ingredients and press into bottoms of lightly greased mini muffin tins. Beat cream cheese and 1/2 c. sugar at medium speed with an electric mixer for 3 minutes or until fluffy. Add eggs, one at a time, beating well after each addition. Add next 4 ingredients and eat until blended. Fill mini muffin tins. Bake at 325 for 25 minutes or until center is almost set. Spread glaze over top of cheesecakes. Cover and chill at least 8 hours. To make glaze: Stir together cornstarch and 1 T water until smooth. Combine cornstarch mixture, crushed pineapple, 1/4 c. sugar and lemon juice in a saucepan over medium heat; cook, stirring constantly, 5 minutes or until mixture is thickened and bubbly. Remove from heat; let cool completely. Makes 96 cheesecakes. And since it was a Spring Fling and since it was May -- what better theme for the third house than Cinco De Mayo! 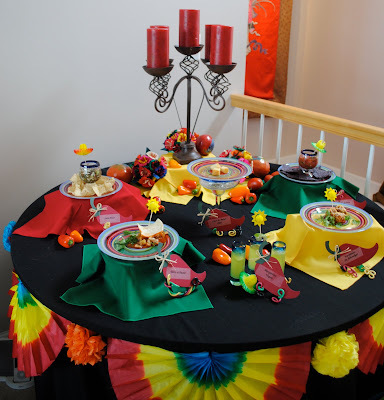 A colorful table -- with chili peppers for the placecards. The hit of the day was "Pedro" holding an early Thalias cookbook which, that year, also featured a Mexican theme at one of the Tour houses. Use a box of the Jiffy ready mix cornbread (8.5 oz) and add 2 T. of taco seasoning to the other dry ingredients. Mix and bake according to package directions. Allow to cool and then crumble. In a large bowl, combine the crumbled cornbread, half of the enchilada sauce, half of the cheese, the diced onion, and the salt. Crumble the beef into the mixture and blend well, using your hands. Shape meat mixture into 1 inch balls and place on a 10 x 15 jellyroll pan, or any cookie sheet with sides to catch the grease. Bake uncovered at 350 for 18 to 22 minutes or until meat is cooked through and no longer pink. In a small saucepan, heat tomato sauce and remaining enchilada sauce. Remove the meatballs with a slotted spoon and place in a serving dish or crockpot. Top with sauce mixture and sprinkle with cheese. Provide toothpicks for serving. It's Tuesday -- and I have not one but three tabletops this Tuesday. 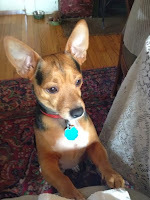 Please join Marty at A Stroll Thru Life and see what else is on tables this Tuesday. And since I do have three tabletops, I'm also joining Tam at A Gypsy's Corner. See what other threesies there are this Tuesday. And since I'm celebrating my second anniversary of Lines from Linderhof, my 600+ post, and my 200+ follower, I'm holding a giveaway -- a favorite book, my herb bible, Betty Crocker Kitchen Gardens, by Mary Mason Campbell with illustrations by Tasha Tudor. If you've entered on Sunday or Monday, you can enter again! Once for a comment on this post and once again if you're a follower. My blog journey has been filled with friends and I'm looking forward to sharing more of Linderhof with you. Oh wow! I can't wait to try these recipes out! Thanks for sharing. It's 5:53, I hope Jim is preparing the martinis.....cheers! Tasha Tudor is my favorite illustrator, so I would be thrilled to win this. Thank you! The Tasting Tour sounds like so much fun. What a fabulous idea for a fund raiser. All the recipes look great too and I have made my copies. What a fabulous idea a tasting tour is!! I love events like this! Enter me one more time please. While you were at your delightful Spring Fling (and, oh my it does look delightful) I was at a Spring Tea (which I just blogged about). Were your ears burning? I told the ladies at my table about your tradition of stopping in the afternoon to take a cup of tea and enjoy a treat. They thought it was a marvelous idea. I was also reminded of you when I sat down to a table adorned with blue and white Spode. I'm not sure of the pattern. Those little tomato bacon thingies look too good to be true - and easy too! What lovely traditions you have on the Kansas prairie. What fun and the recipes look delicious. I'll have to try some of them. I noticed the cider mill on your sidebar. When we lived in Kansas years and years ago - that was our kids' favorite place to go - they couldn't wait for fall so they could get cider and donuts. We went the first year they opened - one of the favorite memories of our kids. I follow you on bloglines too. Great blog. All those recipes look divine! The tablesettings are so beautiful too. I am a new follower...I thought I was already a follower because I visit your blog so frequently...well now I'm an offical follower! I wish I could have come along on this tasting tour. So many lovely little bites to sample. It looks like you had a lovely afternoon. Wonderful menus, the images look delish! mmmm! Beautiful and Tasty! Best combination ever! LOL! 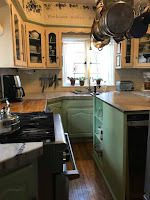 Thanks for stopping by the blog Martha. I'm so glad you like the direction of the dining room. It's not done yet ... and looks SO much better in person. For some reason dark and rich rooms just don't get captured as they should with my camera. :( I need that $200 flash attachment! LOL! 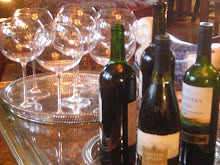 A tasting tour - what a great idea! It all looks so good too. 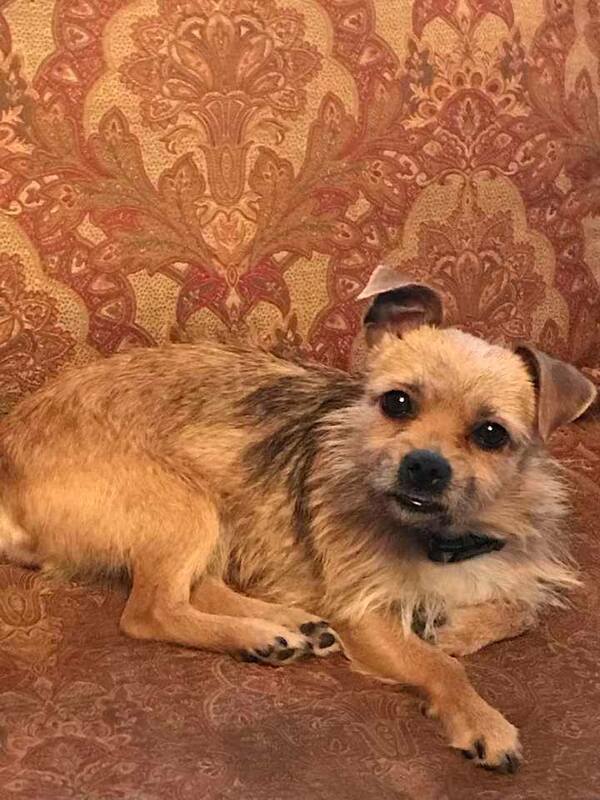 Please enter me in the draw again please. Oh, what fun your Spring Fling is (was? ), Martha! And a Happy, Happy Blog birthday to you! I know how hard it is - I've been at it 2 1/2 years, but only published half the posts. Mucho impressed. That sounds like so much fun! 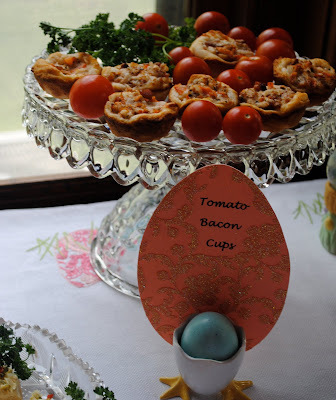 I'm going to make the bacon tomato cups soon. They look just scrumptious! I would get toooooo fat!!! yup!